This press release contains forward-looking statements concerning Lamar Advertising Company’s goals, beliefs, expectations, strategies, objectives, plans, future operating results and underlying assumptions, and other statements that are not necessarily based on historical facts. Examples of these statements include, but are not limited to, statements regarding its ability to qualify or continue to qualify as a REIT. These statements are subject to risks and uncertainties that could cause actual results to differ materially from those projected in these forward-looking statements. For additional information regarding factors that may cause actual results to differ materially from those indicated in our forward-looking statements, we refer you to the risk factors included in Item 1A of Lamar Advertising Company’s Annual Report on Form 10-K for the year ended December 31, 2013. We caution investors not to place undue reliance on the forward-looking statements contained in this document. These statements speak only as of the date of this document, and we undertake no obligation to update or revise the statements, except as may be required by law. 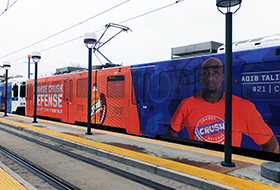 Commuters can expect to see Denver Broncos stars zooming along the Interstate 25 corridor on RTD light rail trains during the remainder of the football season, thanks to a new campaign from Lamar Advertising Company, PepsiCo Inc. and Denver RTD. 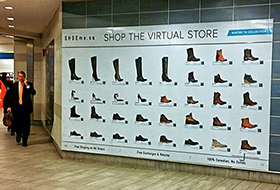 Commuters in Vancouver, BC can now shop while they wait for the train, thanks to a new interactive campaign from SHOEme.ca, a Canadian owned online shoe retailer, and Lamar Advertising Company (Nasdaq: LAMR). Lamar Advertising of British Columbia is pleased to announce the launch of British Columbia’s first virtual shopping wall mural in Vancouver City Station.